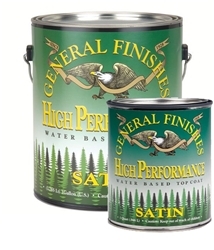 General Finishes High Performance Poyurethane is a superior performing waterbased finish recognized by Fine Woodworking as the "Best Overeall Choice"
It contains all the user friendly characteristics of PolyAcrylic Blend, but with UV stabilizers and other performance additives to protect it from breaking down in sunlight and to protect underlying stains from fading. This is the preferred product with dependable adhesion when brushing over General Finishes Gel Stains and other surfaces including milk paint or bare wood. In addition to exceptional brushing and levelling properties, High Performance can also be sprayed very well with HVLP and other spray systems. Quick drying and recoat times make this a good choice for residential applications that require a minimal yellowing finish at an economical price point.